We managed to photograph him well, and after he had got down and disappeared in the grass we continued towards to Mpila camp. Maud had booked us four-bedded safari tent, which means that we got our own tent including a bedroom and a toilet/shower and a communal kitchen in the between. In the mean while the weather changed from nice sunny, not that hot to cloudy, misty and damn cold! In the night we got some rain and thunder, and the following days were more or less grey, and the evenings and nights …cold! But nevertheless we had amazing sightings during our game drives! 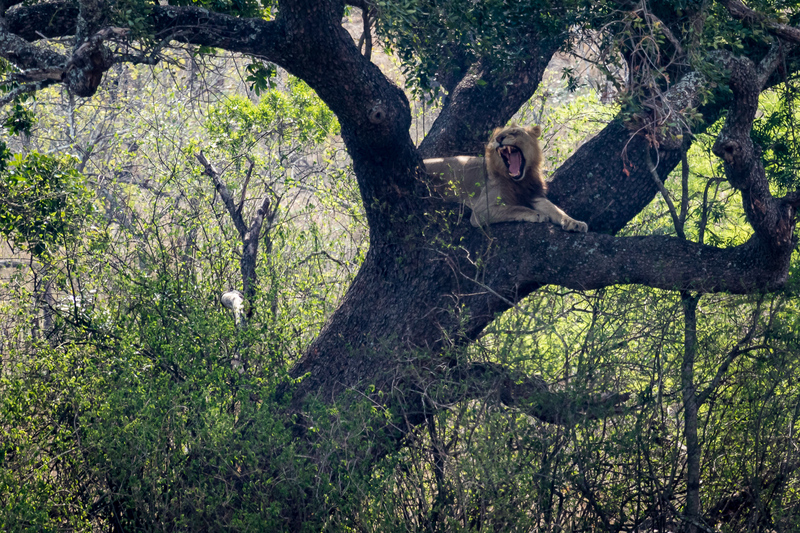 Of course in the terms of photography the plane sunless days were not optional to shoot images, but on the other hand, animals were not hiding in the shadows, as was the case later in the Kruger park. Every day we spend pretty exact 12 hours on the go away from the camp. The gate of the camp opened at 6am and closed 6pm. We left latest 6:05am and returned no earlier than 5:55pm! But every minute was worth it! Too many species to type all down here, but we saw plenty of (white) rhinos, hyenas, warthogs, , birds and elephants very nearby.